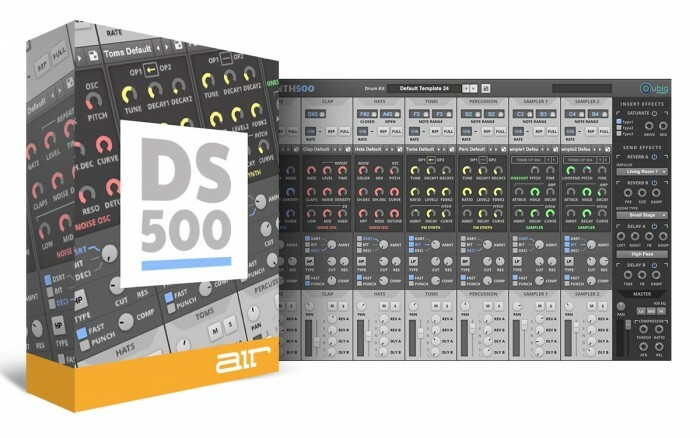 AIR Music Technology 에서 Drum Synth 500 이라는 가상악기를 발표하였습니다. 이 가상악기는 8-channel electronic drum synthesizer 입니다. 이 제품의 기본 프리셋 사운드는 Air Music Tech Strike, Air Structure, Sonivox Big Bang, Akai Professional’s MPC and Alesis e-Drum 등의 사운드를 만든 사운드 디자인 베테랑들이 참여 하여 프리셋 사운드를 만들었다고 합니다. 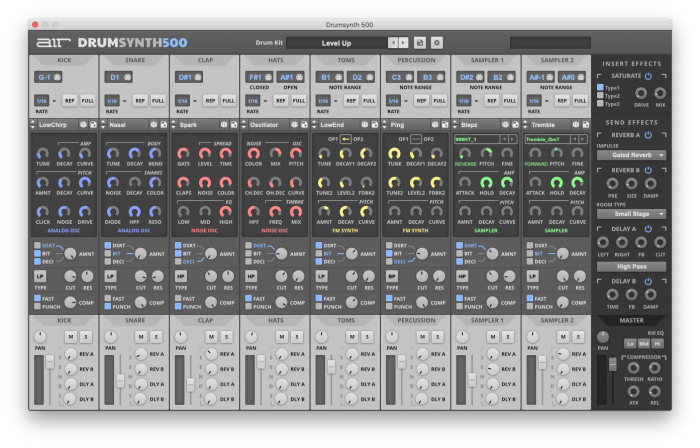 그래서 Drum Synth 500 는 500 drum sounds, 500 drum samples, 50 drum kits and 500 MIDI drum loops 들을 기본 제공합니다. 사용하기 쉬운 직관적인 인터페이스를 하고 있으며, 사용자가 즉시 electronic drum sound 를 뽑아낼 수 있고 Randomize 기능도 있어서 생각하지 못했던 사운드도 쉽게 만들 수 있습니다. MIDI keyboard, pad controller or drum kit controller 들과 쉽게 컨트롤 연동이 가능합니다. 각 채널별로 MPC Full Level and Note Repeat 스타일의 기능이 들어 있습니다. 각 채널별로 3가지 distortion effects (including new Bitcrusher and Decimate) 과 5 filter 그리고 2 compressor 들이 탑재되어 있습니다. 마지막으로 Master channel 에서 3가지 종류의 saturation effect 가 들어있고 그외에도 convolution reverb, algorithmic reverb, stereo delay, mono delay, compressor 그리고 unique Kill EQ circuit 가 모두 들어 있습니다. 64 bit AU, VST, AAX 플러그인 포맷지원, DAW 없이 Standalone application 으로 사용 가능합니다.